A vibrant city, I instantly fell in love with Seattle Washington. We only had a weekend but found plenty of things to do in Seattle. Located on Puget Sound in the Pacific Northwest corner of the USA, it reminded me of our home in Auckland, New Zealand. Water, mountains, forests, and green parklands surround both cities. 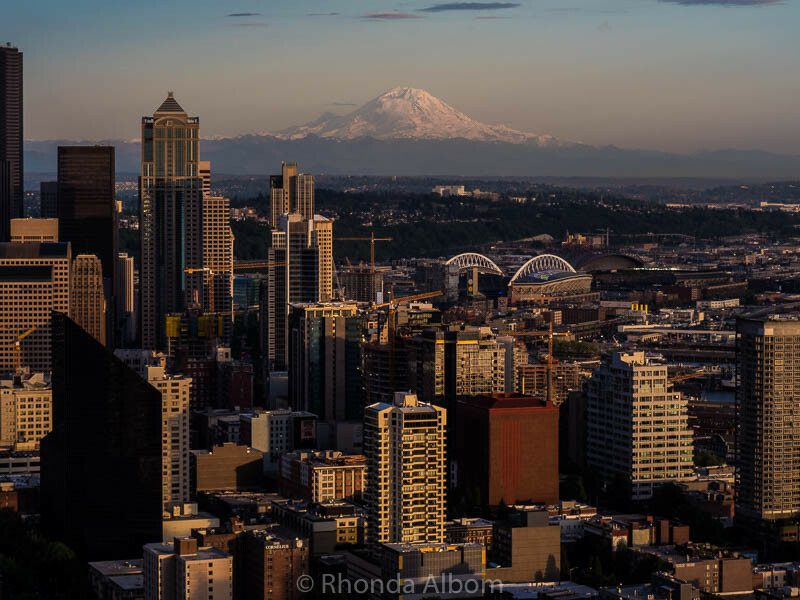 In Washington, the nearby evergreen forests are massive, thus giving Seattle the nickname of “Emerald City.” To hit the highlights, we have created a Seattle itinerary filled with 10 fun things to do in Seattle Washington. 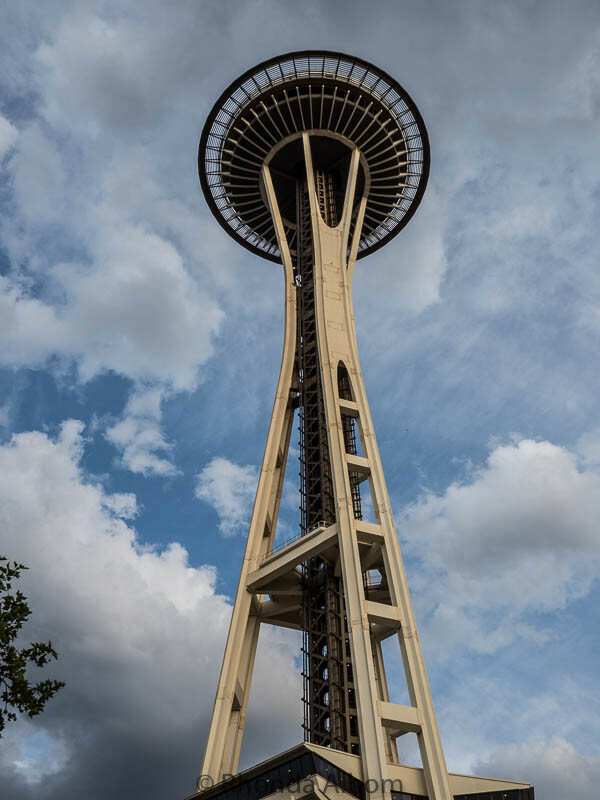 We love Seattle and saved tons of money on entry fees with the Seattle CityPASS as it included the places we wanted to visit. 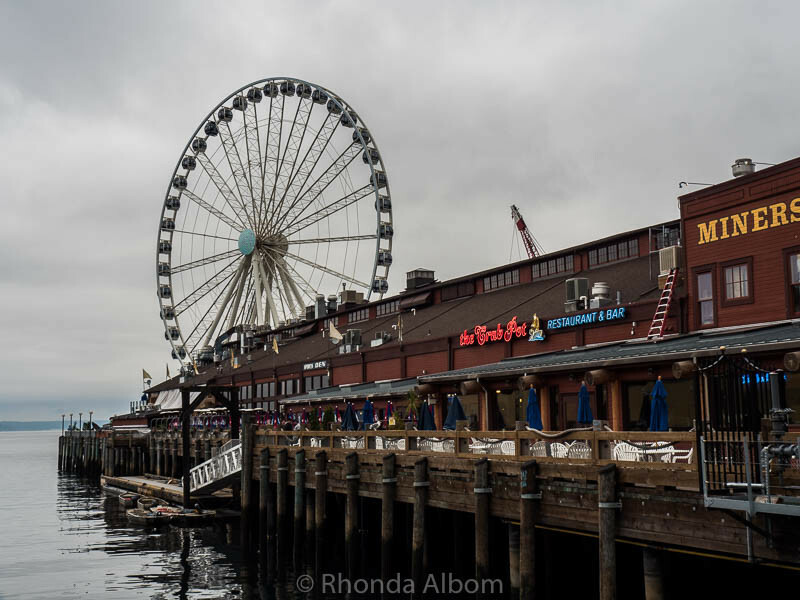 It provided us with both quick and easy access to several Seattle highlights as well as 50% savings over the total cost of these activities, had we paid for them each individually. A favourite destination amongst tourists and locals, Pike Place Market is one of the United States’ oldest continuously operating farmer’s markets as well as being a community resource for low-income families. Whatever it is you are looking for, you can find it here. Flowers, fruit, and vegetables are everywhere, but if you ask me, watching fish being tossed through the air is one of the best things to do in Seattle. 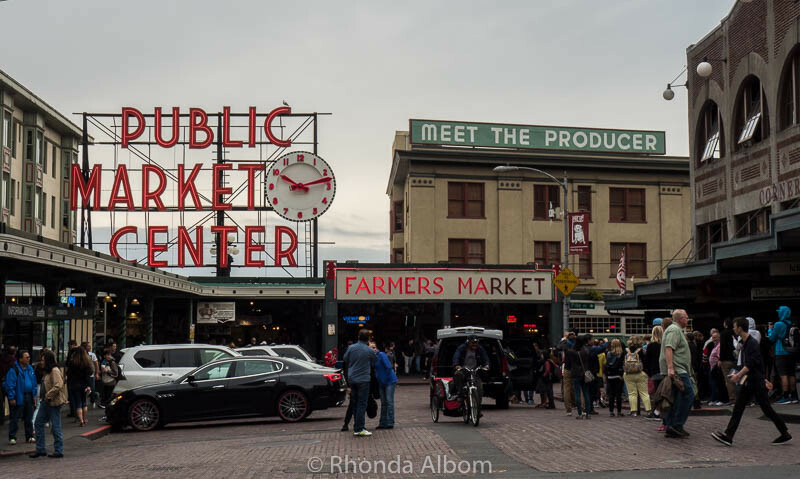 The market it huge and can be navigated on your own, or opt for a Pike Place Market: Walking Food Tour that includes history and samples. The tour is rated quite highly and is a great way to be sure not to miss the highlights. The iconic entrance to the Pike Place Market. 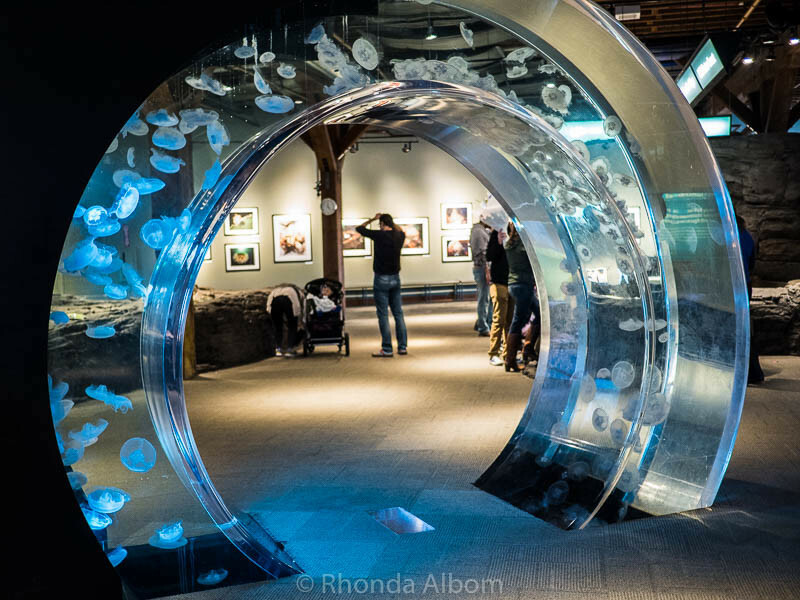 Home to the marine life of Puget Sound and around the world, the Seattle Aquarium’s mission is “Inspiring Conservation of Our Marine Environment.” There are hands-on opportunities for children, and plenty to see for adults. Puffin birds and the sea otters are two of the more unique creatures we saw. The Seattle Aquarium is a featured destination of the Seattle CityPASS. Located in the Life on Edge section of Seattle Aquarium, these moon jellyfish looked luminescent as the colours in the tube changed. 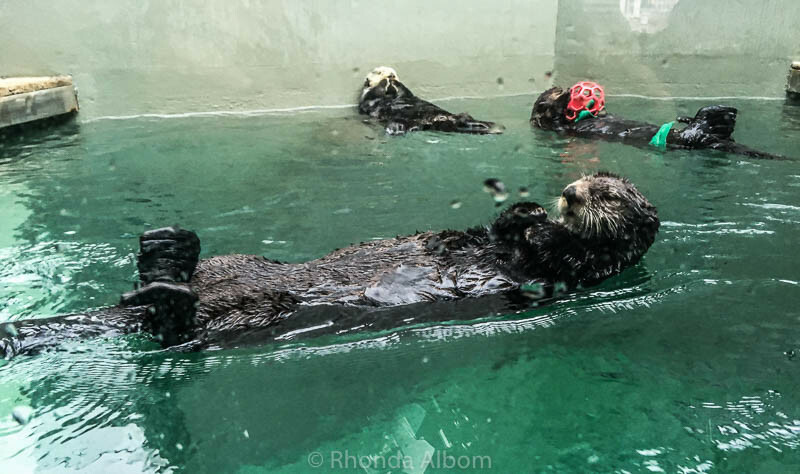 Sea otters are so adorable, and are amongst the three types of marine mammals a the Seattle Aquarium, the other two being Northern Fur Seals and Harbour Seals. Avid sailors, we love to view a city from the water. 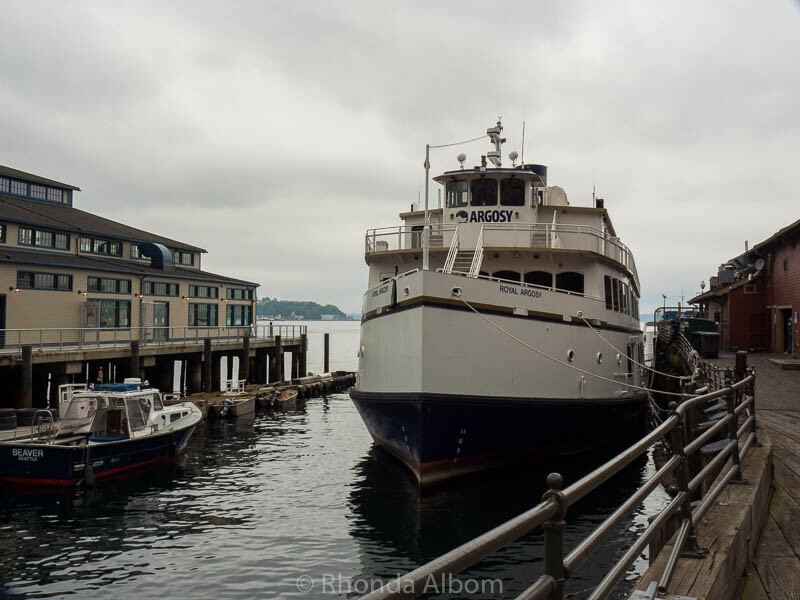 However, the weather was quite cold and misty and we opted not to join into any of the Seattle cruises. Even skipping this activity that is included in the Seattle CityPASS, we found the pass offered us overall savings. An Argosy Cruise boat used for Puget Sound Harbor Cruises. Boasting breath-taking views of Puget Sound from 200 feet above the water, we opted to skip the Great Wheel on the cloudy day that we visited, as visibility was limited. It runs until 10 pm on weekdays and midnight on weekends making it one of many things to do in Seattle at night. The Seattle Great Wheel features climate controlled gondolas. Located on Pier 54, the building and views are half the fun. It’s an icon, one of the classic Seattle landmarks. It’s a restaurant that’s been around since 1938, and it still serves mouthwatering meals. We thoroughly enjoyed our dinner and view at Ivar’s. Built for the 1962 World’s Fair, it was considered a space-age wonder. It’s a classic Seattle landmark and probably the best known of the Seattle attractions. The Seattle CityPASS includes both a day and nighttime entry. However, if you are not in Seattle long enough to justify a CityPASS, you can purchase a single entry ticket ahead of time to avoid the sometimes quite long ticket queue. Featuring the vivid colours and fluid shapes of the glass creations of Dale Chihuly, this is one of my personal favourite top two destinations on this Seattle itinerary (the other being the Museum of Flight). It’s a colourful photographer’s treat. 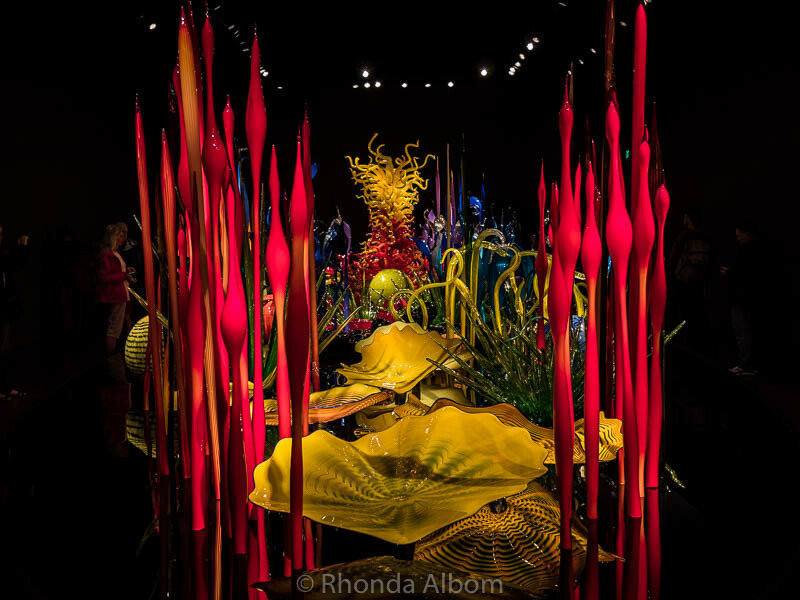 The Seattle CityPASS offers the option of Chihuly Garden and Glass or Pacific Science Center. We opted for the glass museum, but had we been traveling with young children, I would probably have gone to the Science Center. If pop culture, science fiction, or rock music are your thing, EMP Museum is the perfect Seattle museum. 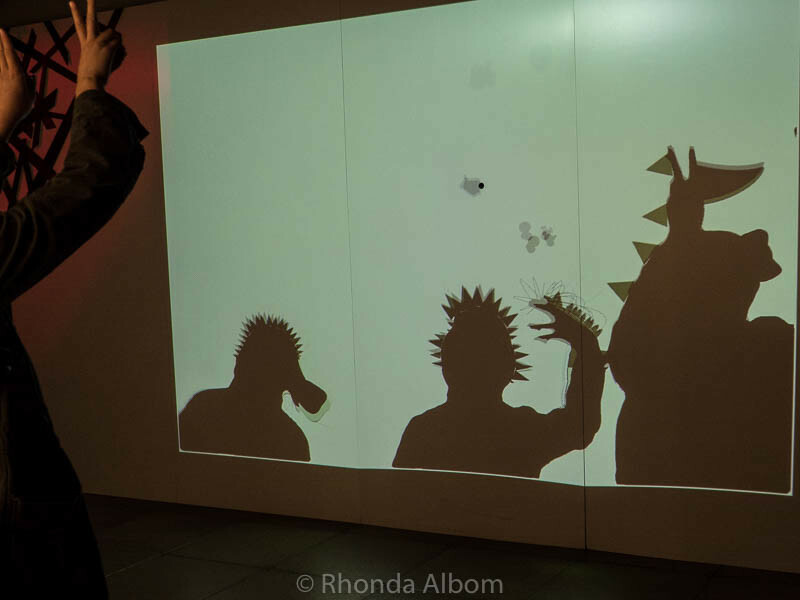 New Zealand’s World of Wearable Art (WOW) made its North American premiere at EMP. The Seattle CityPASS offers the option of the EMP Museum or the Woodland Park Zoo. My niece is having a bit of fun at the EMP Museum. This monster Shadowbox was popular with both kids and adults. The delicious food is almost secondary to Dale Chihuly’s 28 collections that are hanging on the walls, shelves, and ceiling, or embedded into the table tops. Aside from the glass art that made him famous, Chihuly collected things like pocket knives, inkwells, string holders, tin toys, and more. Be sure to walk around the restaurant to have a closer look. 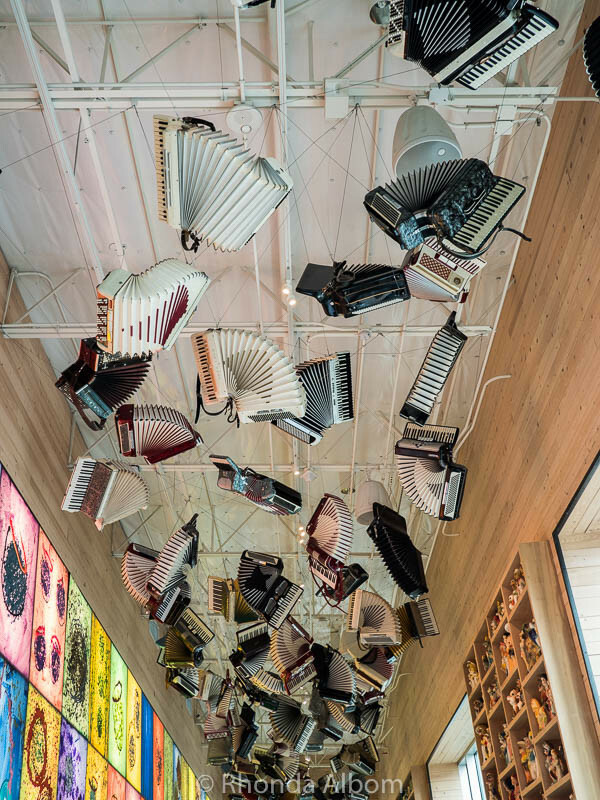 The accordions hanging from the ceiling are one of 28 collections found at Collections Cafe. Taking you through flight history from the earliest planes to the space age, the Museum of Flight has it all. It is one of my two favourite Seattle itinerary destinations (the other being Chihuly Garden and Glass). 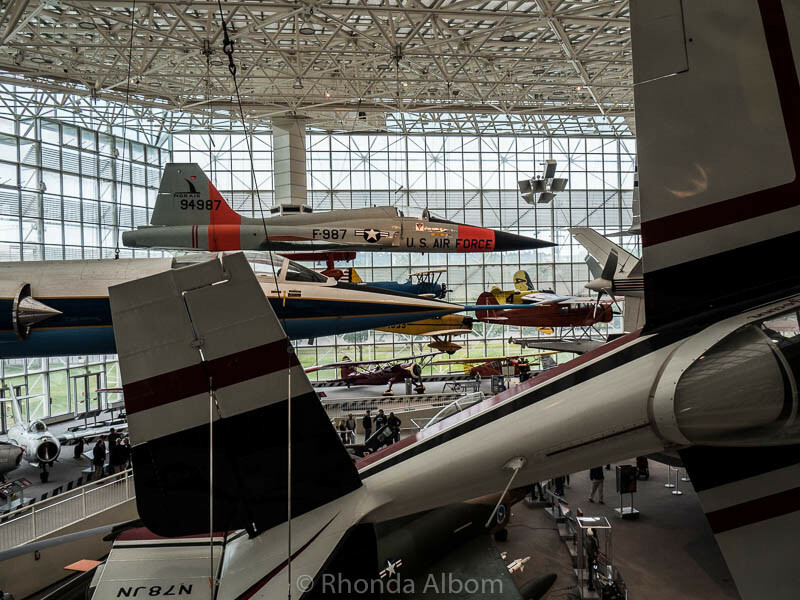 History is easily seen through the aircraft filling the initial room of the Museum of Flight. Hotel Monaco, a Kimpton Property: While there are plenty of Seattle accommodation options, Hotel Monaco will always be our first choice. We stayed at Hotel Monaco and loved it. The attention to every detail, the fun and funky decor, the animal-friendly nature (with both pet or non-pet friendly floors), and the daily afternoon wine tastings sold us on Kimpton properties. This was the first of many. It met our needs for comfort, location, and ambience. Click here to read our full review of Hotel Monaco. What are your favourite things to do in Seattle? Would you make any changes to this Seattle itinerary? PS: Seattle is one of our favourite US cities. Disclaimer: We were provided with a CityPASS as well as complimentary entry to several venues and/or media rates. However, the opinions expressed here are strictly my own. What a great article Rhonda. Seattle is a fascinating city to explore. Of course I’m going to add the Gum Wall as a suggestion. It’s very close to Pike Place Market so would fit easily in your itinerary. 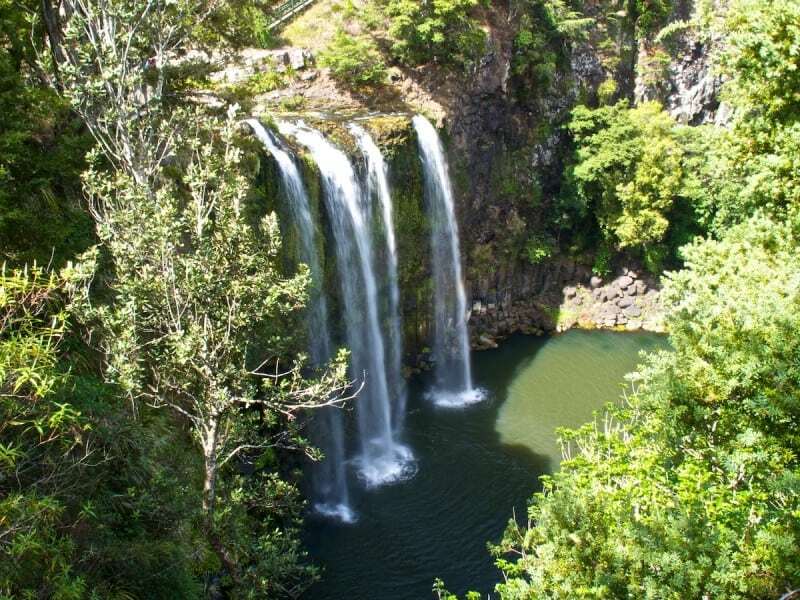 I have been planning to go here this Spring ..it’s beautiful! Seattle in springtime will be so lovely. Seattle is one of three cities (other two being Miami and Boston) in the USA that I really want to visit but haven’t got round to yet. It looks like there is so much to see and do! Pike Place Market is somewhere I’ve read about before and EMP Museum would be right up my street! Great post! Reading this brings back many memories and I know some of these gems will highlight someones trip. I love Seattle and have been a dozen times. I haven’t been to the Museum of Transportation, but that’s on my list for next time! Seattle is down the street from me (Vancouver) and its been awhile since I’ve been. But, I haven’t been to the Museum of transportation and that looks really cool. It is one of the best cities for foodies too. Thanks for the suggestions. Seattle looks like a great place to use some of our Southwest miles! I would head to the Collections Cafe you recommend. The accordions — How fun! Your itinerary has a good flow to it and lots of variety. I haven’t been to Seattle in about 10 years but I’ve had a hankering to go back lately and have been scanning flights. I love Seattle – the whole Pacific Northwest is so beautiful. Great tips on what to do there – I did quite a few of them but there are still a few to do when I go back. Bookmarking for future use! Seattle looks amazing Rhonda. I’ve not been to the US at all. The aquarium looks lovely and I particularly like the jellyfish doorway. How beautiful and what a clever idea! We loved visiting Seattle a year ago. The Chihuly Museum was one of my favorite places, and we enjoyed lots of fresh seafood in the restaurants. I think the farmer’s market would do it for me, so many photos from so many different angles. Love this! I grew up about 20-30 minutes from Seattle and went there often on field trips. I moved away after high school and never really got to enjoy the city as an adult, so I make sure to find new things to do in the city whenever I visit my family! I’ll be there next month and will finally go to the top of the Space Needle and hopefully the Chihuly museum as well. Thanks for the lovely post! It really sums up all of the popular sightseeing highlights. Thanks Beth. It’s funny how we don’t do the things in our own city. I think we lived in Auckland for about 10 years before we ever went up in the Sky Tower. Seattle has been on my bucket list for a long time. it looks like a beautiful city. I would love to visit that Acquarium!!! Seattle was really fun, but in truth, the highlight was spending the weekend with my niece. We visited many of these places when we were in Seattle many years ago but not all of them. I don’t recall the Chihuly Gardens or the Great Wheel being on my radar, so I wonder if those have been added since I was last there. It’s definitely a city that I enjoyed and wouldn’t mind doing a return visit. By the way, I was just thinking today that I am so glad your health is much improved and that you’re able to fly again. I hope you get a chance to get back and visit Chihuly Garden and Glass, it is really special. And thank, I hope the remission sticks. Seattle looks very gloomy but at the same time beautiful. I’ve seen so much rain in Seattle from the TV show Grey’s Anatomy. Lol. Pike Place looks like my kind of area to go to while there. I have never seen Grey’s Anatomy, but it was a bit gloomy for the days we were there, yet it is such a wonderful city, I overlooked it. Rob misses visiting Seattle, and says it’s been far too long since he’s been there. Ann is now smacking Rob for not taking her there already. #TravelBloggerProblems… 😉 That’s a great itinerary! I also like visiting Post Alley the area around Pike Place Market, including Starbucks #1. Such a great city! LOL – I love your comment in Third person, and I hope that Ann wins this battle. Thanks Michelle. I am focusing and trying to be more useful in my writing, glad it is coming across. I haven’t seen the movie yet, but otters already make me smile. And, agree on those wheels. We also saw one being built in Las Vegas, and one in Toulouse, France. I heard a lot of Seattle and I’d like to visit. Your guide will be of great help. My favorite would be the Aquarium. Seattle is a really wonderful city. Otters and puffins make me smile too. Seattle is one of my favorite cities.. And those sea otters, so cute! Agreed. I was so pleased to get a halfway decent shot of the otters. So many things to do in Seattle – which I only know as a wet city 🙂 Looks like there is still plenty to do even if it is raining. It is a bit of a wet city, and that effected our choices, but we still found plenty to do. Agreed. Adorable, the puffins too but I couldn’t get a decent photo as they splashed up the glass. Rhonda, We love Seattle. We go often, because my youngest daughter teaches in Tacoma. 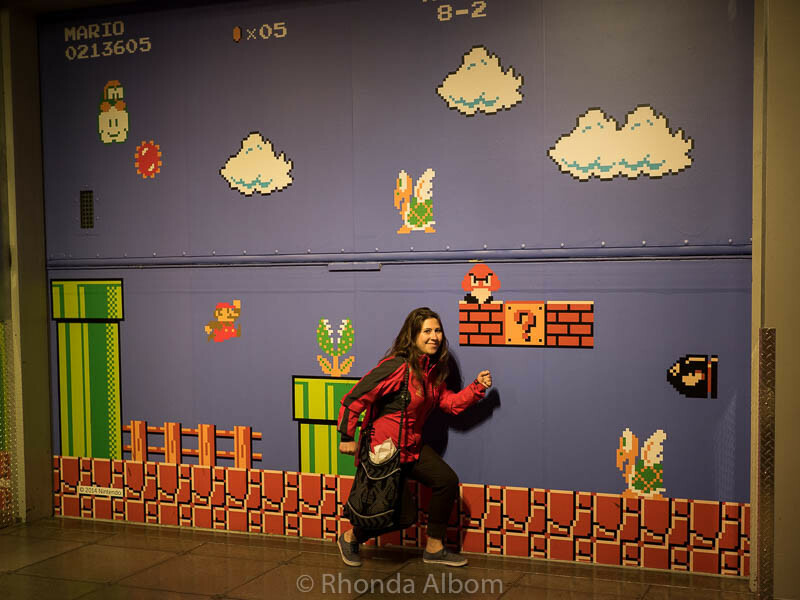 I have not yet been to the EMP….next time! To be honest, we probably wouldn’t have gone to EMP had we not had the CityPASS. I always think that’s part of the fun of a city pass, it has places you really want to visit, and others too. I love, love this itinerary! I have used the CityPass on other cities and it is a great way to get to see the biggest attractions while still saving money. Can’t wait to visit Seattle. Seattle is an awesome city. So much more to do than can possibly be covered in a weekend. It seems that sunshine in Seattle is a hit and miss! I’d love to visit though. I’m sure it’s even more beautiful in real life, although your pictures look great. Those sea otters look so cute! Honestly, I loved the Pacific Northwest. If we ever moved back to the states I am pretty sure that is where we will end up. It’s always interesting to see how other people see places you’ve been to. You did much more than we have done during our visits there, and there are definitely new things since we’ve last been, like the Chihuly exhibits. maybe it’s time to return…. LOL – we didn’t have kids with us on this trip. My niece is in her 20s, another adult. It’s easier to do a lot more. 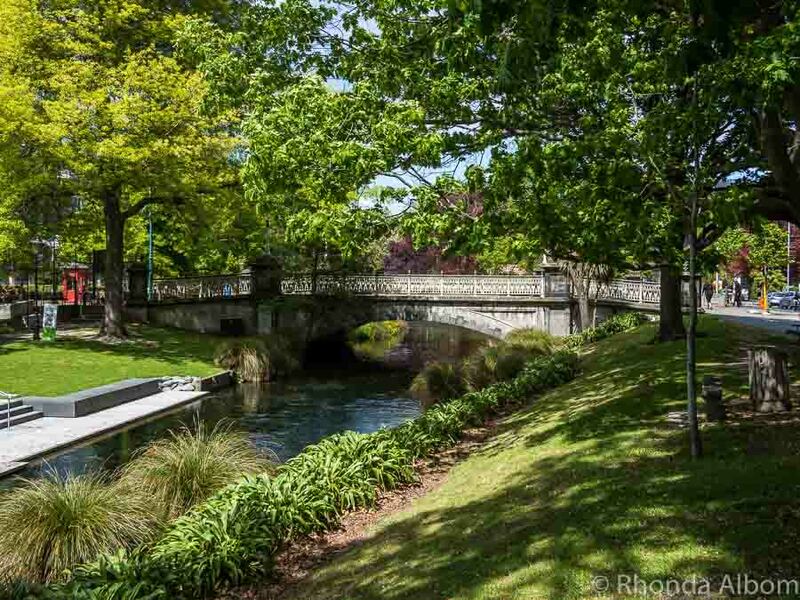 If Auckland is a lot like Seattle, I definitely need to add Auckland to my travel plans. I adored visiting Seattle and the whole north west coast will always hold a special place in my heart for it’s beauty and outdoor pursuits! The entire Northwest coast reminded me of New Zealand, more than anywhere else we have been (except maybe Ireland). The moon jellies were so cool, and yes very real. Seattle is an amazing town. We’ve only been to Seattle once. Of course, we had to go to Pike Place Market and the Seattle Space Needle. Those are iconic must-see places. If I remember correctly, we also ate at Ivar’s. But one of the most memorable things we did was to take the Seattle Underground Tour. It was absolutely fascinating to see the old city buried beneath the new. I think our trip was before the advent of the CityPASS, or at least we didn’t know about it. Next time around, we’ll take advantage of that. I would add Chihuly Garden and Glass to your short must see list. Also, I will add the underground tour to my next visit. That aquariumlooks fantastic- next time we are up we will definitely go there! Cheers! It’s a pretty good one, especially if you are into conservation. Looks like the weather could have been better, but you still did lots of wonderful things. How fun. We really didn’t let the weather spoil our fun. We never do. I think many of these attractions were not there yet when we lived in the area. We enjoyed the Underground Tour downtown. I’m not sure if it’s still there. 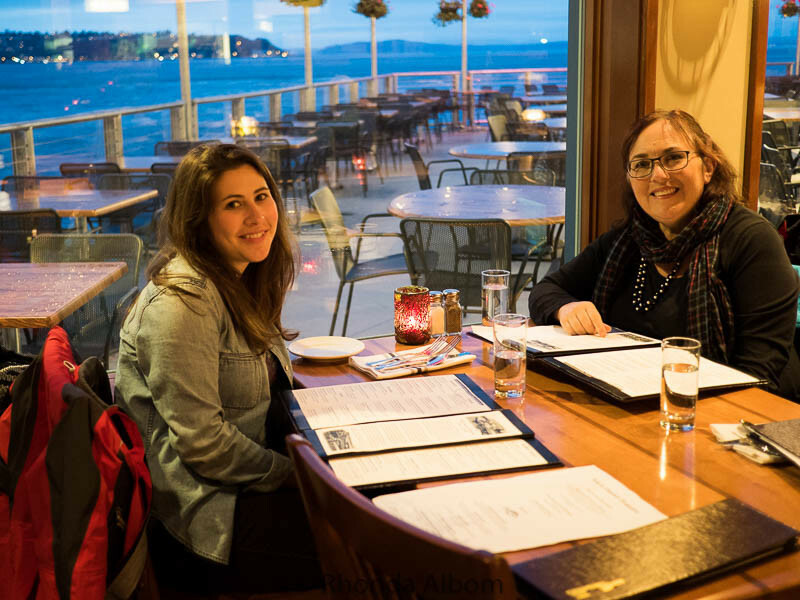 WE did enjoy a dinner at Ivar’s but on Lake Washington. We had delicious salmon. I think the location where we ate is gone. Nice to know that Ivar’s isn’t. Did they have salmon where you ate? Or just clams? I’d like to go back sometime and see the Space Needle. It was there when we were, but we just did a lot of other things instead. I loved Seattle and hope I get back. Reading the comments here there are a few highlights we missed, and the Underground tour will go on the list, as well as Ivar’s Salmon House. Our menu was pretty comprehensive seafood. Actually, I don’t think any of the three of us had clams. You have a great summary here. 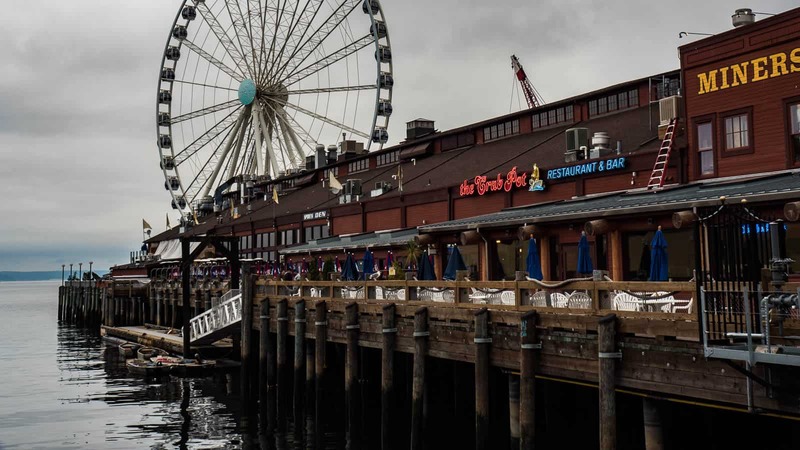 My favorite Seattle restaurant was Ivar’s Salmon House (used to be called Ivar’s Indian Salmon House; all the employees were Native Americans) on Lake Union. What a view! Ivar died while we lived in the Seattle area. He left Ivar’s Indian Salmon House to the University of Washington Business Dept. It wasn’t quite as good without Ivar in charge. He was a real character. Thanks Janie. Ivar’s Salmon House is the same Ivar but a different location. Very beautiful and exciting attractions.I’d love to visit Seattle one day! I hope you get there, it is an awesome city. I love Seattle and the whole Pacific Northwest, really. I’m bummed I didn’t think to go to the Aquarium since there are so many of my favorite animals, sea otters. Oh well, next time! 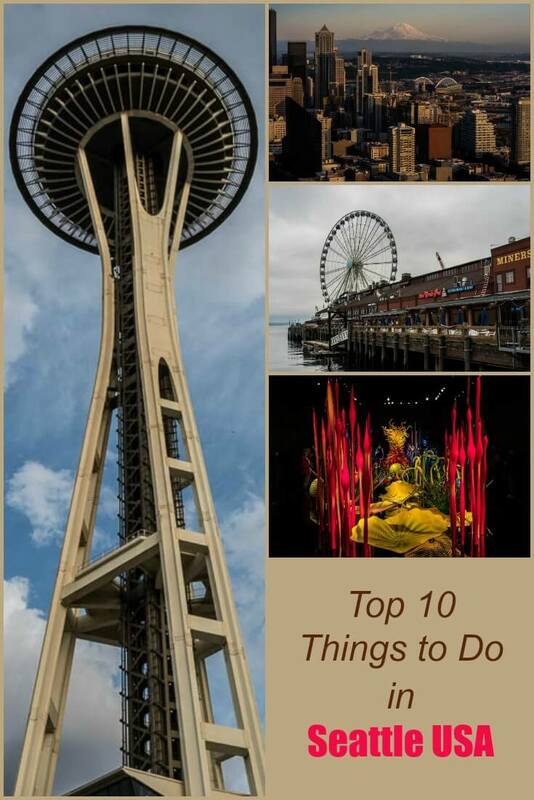 Definitely agree with your recommendation of Chihuly Garden and Glass and I would also add the Fremont Troll if you can get out there! I agree, I really love the Pacific Northwest. There is lots more to come as we drove down to San Francisco along the stunning Oregon Coast. The otters are so cute. Too bad the glass was too dirty to get a really good shot. The puffins were even more adorable, but even dirty glass – fine for seeing through, just not great for photos. LOL – that would be quite a bit out of the way, and a bit of a pain to cross customs twice. What a view of Seattle with Mount Rainier in the distance. This was just beautiful. WE have had a heck of a time on this vacation. I hope that some day I can have such a vacation. Thank you for taking us with you Rhonda. Thanks Paul. I don’t really think of most travel as vacation, it’s more of a lifestyle for us. Would be nice if we were always on vacation. You forgot the bike paths! Seattle has some of the best urban cycling paths we have done. Good call, I hope people read the comments too. Hotel Monaco even offered guests bicycles to borrow. Well, I’ve done three of those things. Some of the others weren’t there when I visited. Guess I need a return trip. We haven’t visited them all either, thanks to the weather.